Today’s divided political climate has affected PR strategy for many companies and brands, including those who like to stay far away from partisan matters. Though it may be an opportune time for some brands to take a stand on relevant issues, many choose to remain neutral on hot-button topics, and understandably so. So, how did Keurig find itself in hot water this week after pulling advertising from Sean Hannity’s program? And what should companies do when targeted with boycotts or other potentially damaging actions? Among other brands, Keurig was targeted as a Hannity advertiser when protesters were steamed by what they saw as Hannity’s defense of Roy Moore, the Alabama Senate candidate now facing accusations of child molestation. 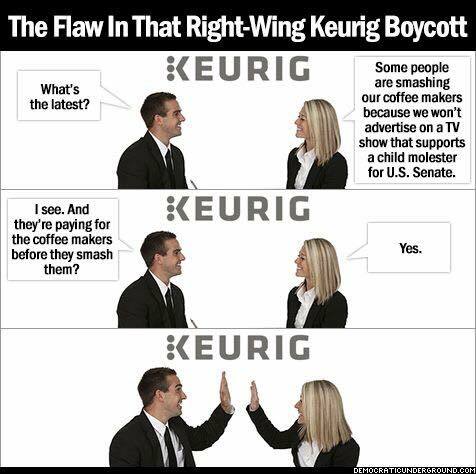 Big consumer names tend to be particular targets of such protests, which is probably why Keurig attracted more calls to drop Hannity than less well known advertisers. After Keurig tweeted that it would, in fact, change its ad schedule, it was then singled out by the pro-Moore faction, egged on by Hannity himself. Reports and occasional videos of angry Keurig owners smashing their appliances appeared on Twitter, and #boycottkeurig swiftly rose to the top of Twitter trending topics. What’s a brand to do? A few simple steps can help protect reputation and resolve the issue relatively quickly. Have a clear advertising policy. Boycotts are the new brunch among the politically active, so major advertisers should decide in advance what their policies are. Smart marketers determine the precise circumstances under which they would pull ad support on a given network or publication. Many marketers draw a distinction between distasteful or illegal personal behavior by a broadcast personality and the actual programming content of a given broadcast. That’s why several major brands deserted Fox anchor Bill O’Reilly after claims of sexual misconduct, but boycotts of Sean Hannity’s opinion-driven program have been less effective. Whatever the case, a set of standards blessed by everyone will make it easier to come to a decision and stick to it, should a boycott be threatened. But any brand who takes a decision in a charged situation like the Moore allegations should know that its move will become public, and internal communications are likely to leak. More importantly, any reversal will simply swap one angry mob for another. The key to weathering a media storm in most cases lies in adopting a position and sticking to it. A wishy-washy stance is likely to be seen as weak, and during difficult times, mixed messages are rarely helpful to employees and stakeholders. Anyone who has been in the eye of the storm will tell you that it’s nearly impossible to keep up with media inquiries, respond to customer calls and posts, and communicate with stakeholders when targeted by angry protesters. It pays to overprepare for the public and internal response after any move that may seem controversial. That means investing in rapid response for customer service, media relations, investors, distributors, and any other business partners. In the case of Keurig and the fast-brewing controversy, it’s unclear how much, if any, real brand damage was done. The boycott hashtag seemed to be driven by bot accounts (“botcotts?”), and the smashed coffee machines were a spectacular video meme for a day, but they really made no sense if someone really wanted to hurt sales and harm the brand. This falls under consistency, but it deserves to be called out. What’s extraordinary about the latest Hannity dustup is the number of advertisers who tweeted that they would pull their ads, including Volvo and Realtor.com, who later deleted those tweets after Keurig was targeted. Others, like Hebrew National, later hedged their tweet, explaining that the brand hadn’t bought ads on hannity’s show in several months. These brands were lucky in that the news cycle quickly grew worse for Moore as new revelations came to light, which was acknowledged by Hannity, and the whole situation simmered down. But as the president has shown, a tweet is a public statement, and it’s best to stand by it and be prepared to respond. In his employee memo, Keurig’s Gamgort wrote, “The nature of social media and the internet news environment is that stories like this explode, and generally do not disappear quickly…” Yet today’s news cycle moves at such a blistering pace that if all else fails, the best response to a social protest may be to hunker down and ride out the storm.